SATURDAY, Nov. 22, 2014 (HealthDay News) -- The wide variety and complexity of foods served at holiday gatherings can pose a threat for people with food allergies, an expert warns. "Every person is different and there are so many types of food allergies that it can be really difficult to avoid all allergens over the holidays," Dr. Guha Krishnaswamy, director of allergy and clinical immunology at Wake Forest Baptist Medical Center, said in a hospital news release. "If you know you have food allergies, caution should overrule your desire to taste something new, and always carry an EpiPen that is up-to-date," he advised. Most allergic reactions to foods occur within minutes. 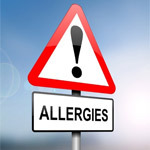 The most common allergens are shrimp, soy, egg, wheat, milk and fish. While the main ingredients in a dish may be safe, allergic reactions can be caused by additives, spices and colorings, Krishnaswamy said. Some people have a condition called Alpha-gal syndrome, which is an allergy to the sugars in beef, pork and other red meats. Unlike most other allergies, people with this condition don't have symptoms until hours after they eat meat. Another unusual allergy is called food dependent exercise-induced anaphylaxis. This is a severe allergic reaction triggered by intense exercise a few hours after eating certain foods, including wheat and celery. Some people who become ill after eating certain foods don't have food allergies, but rather conditions called food idiosyncrasies or intolerances. For example, some people get migraines after they consume certain combinations, such as cheese and wine, Krishnaswamy said.